I never know what to say or do when someone I care about is seriously ill or has lost someone they love. I bake, I take dinner, sometimes I write letters to let them know how I feel, and sometimes I sew. All things that feel inadequate when someone is facing death, or has lost a loved one, but they are the only things I know to do. I was learning to quilt, and I decided to make a special quilt for his birthday, a tribute to his life. I made a list of the things that I knew about him. He was the father of three sons and had three grandsons. He loved anything to do with the ocean. He was a whale watch docent for many years, and served as President of the Pacific Shell Club. He loved to fish, and Frank had a green thumb that I envy to this day. Over the summer of 2008 I embroidered quilt blocks with things that I felt represented his life. I finished the quilt just in time for his 79th birthday in October. It was my first quilt, and had a number of flaws, but I packed it up and shipped it to him with my love. Frank was in hospice when he received the quilt, and I’m told that he loved it, flaws and all. The quilt was my way of wrapping our love around him when we couldn’t be with him, and I can only hope that he felt that. We lost him just weeks later. On February 7th of this year we lost our dear friend, Bill Majik, again to cancer. Bill was only 56 years old. I wanted to be there for Bill and his wife Tammy, and over the length of his illness there were long conversations between Tammy and I, hugs, tears, and more words….and no matter what I said, I felt it was wrong, trite, inadequate. I made a few meals, my favorite way of showing my love, but of course, nothing I could do could ease their suffering. When Bill lost his battle with cancer in February, my heart broke for both Tammy and Bill. They had been madly in love even after twenty years together, and now Bill was gone, and Tammy had lost the love of her life. Of course I wanted to do something, and I didn’t even know if it was the right thing to do, but I offered to make a quilt for Tammy out of Bill’s shirts, something she could wrap herself in to feel his love. Tammy liked the idea, but a few days later she asked if we could make Teddy Bears out of Bill’s shirts for each of his daughters and his granddaughter……and could I teach her to sew. We began making the bears while she was still on leave from her job. We used some scrap fabric to make the first bear…basically I just supervised and Tammy did the sewing. It came out perfect. Since we started we’ve completed two bears from Bill’s shirts, have two more partially done, and at least two additional bears to make. I’d have to ask Tammy, but I think learning to sew the bears together has been much more healing than if I’d sewn them for her. Selfishly, I have to admit that working on these bears with Tammy has been cathartic for me. 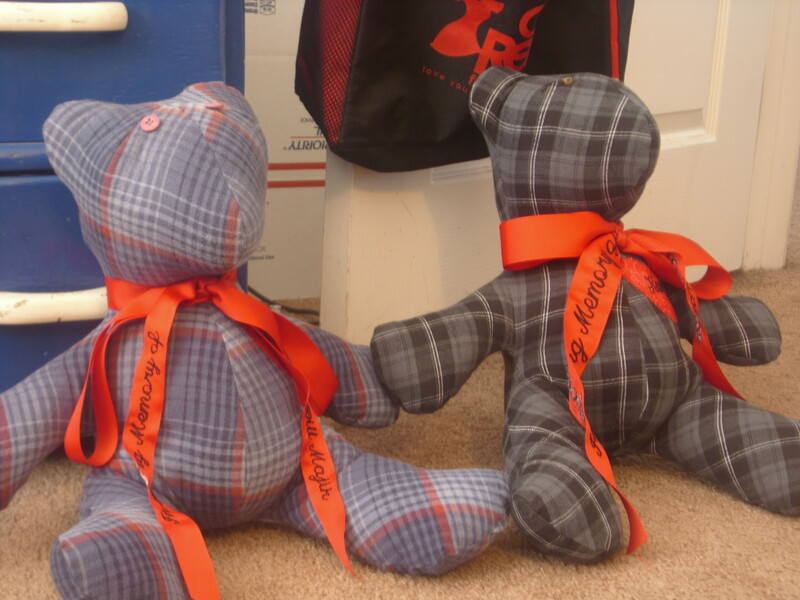 Each bear has a heart appliqued on it’s chest with the name of the daughter who will receive it, and a ribbon around it’s neck that reads, “ In Loving Memory of Bill Majik”, and it’s hard to imagine that anything could have been made with more love than these bears. We all have different ways to cope with loss, and to show our love. I’d love to hear your stories, you never know whose heart they’ll touch or inspire.